Our count was scheduled for Saturday, December 16th, but Mary Prismon and her daughter Carole went up on Friday, and what did they find? 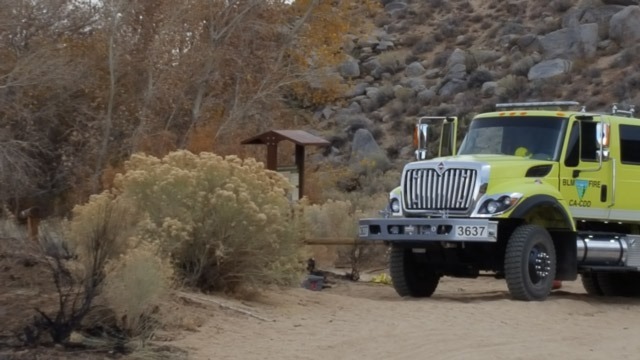 Fire trucks at Butterbredt Spring! Doesn’t look so bad, right? That’s the most favorable angle. On Saturday afternoon my car went by and Chris Lord took a few snaps. 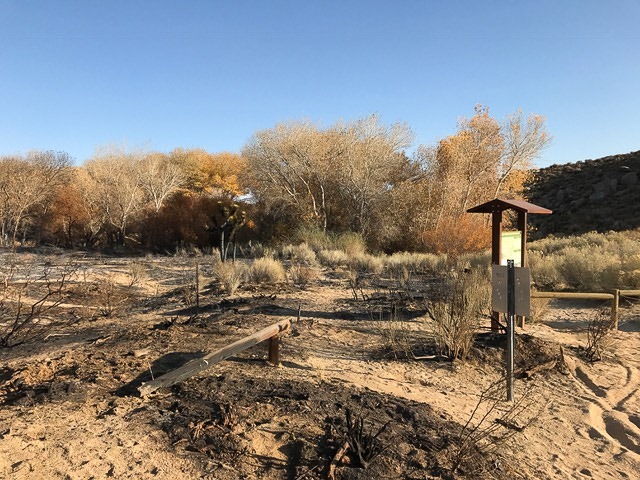 This is where the fire started, according to the Park Rangers we spoke with. It could have been a car parked in the brush with a hot exhaust pipe – we don’t know. 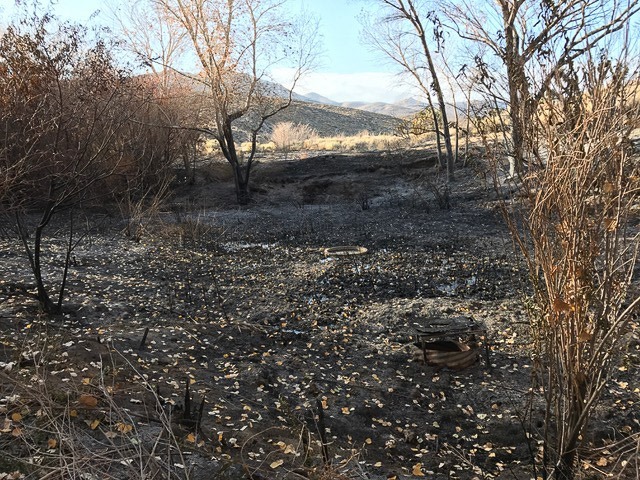 We’ve been mulling over just how we might get rid of the bulrushes that soak up all the spring water, but a fire was not one of our options. This view would have been 100% bulrushes before the fire. Temporarily, they are gone, but the roots remain and they will probably come back very soon. The area covered by the fire extended over a much larger area than you see here. The Important Bird Area sign built by Keith Axelson was destroyed. The Park Service sign survived. We’ll bring news of the plans the Park Service may have when we hear them. 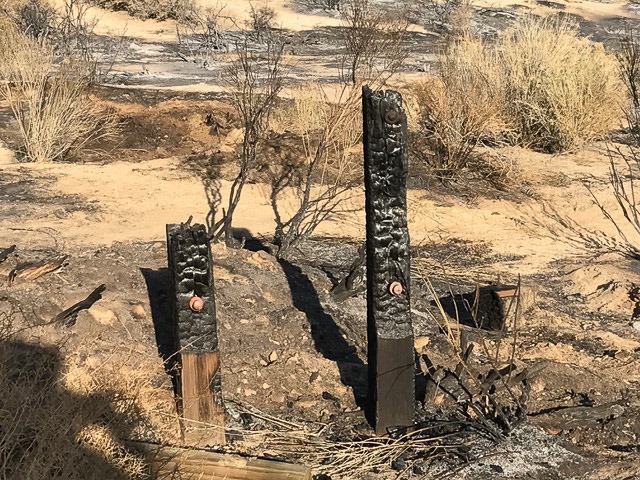 Until then, most of the trees down the canyon from the spring survived and we don’t anticipate the burned areas will affect birds coming through, although it may encourage some Indigo Buntings to hang around. One never knows. So, on to the count itself. The weather was quite cool, but winds were light and the sun came out so it was a good day to bird. After spending the morning from 8:30 a.m. chasing birds we ended up at Sageland Ranch and for the first time all the counters were gathered together. Our thanks to Reed Tollefson, Jake Abel, Steve Hylton, Mary Prismon, Carol Reed, Chris Lord, Jean Garrett, Alice Bragg, and a special thanks to Lys and Kit Axelson who opened Sageland Ranch for us. Here’s the list. We saw an above average number of birds and species – perhaps the rain last year has encouraged more nesting. Nothing truly unusual showed up although we were very happy to see a Golden Eagle; they have not been around for a while. Once again I got skunked on Pinyon Jays, even when seen by my own group! Re this report, excellent, but, I need to correct the M. Prismon and Carol account. We spent the night in Mojave Friday and only saw the results at Butterbredt Spring on Saturday morning of the Count. Otherwise, we would have observed big fire and flames! The fire occurred on Friday. Most sad, the loss of Keith’s sign and the fencing which the SMBAS installed some years ago. The Spring area should recover well and soon, but damage to fencing and signage is definitely longer term issue.